Although there are many effective treatments both prescription and herbal-based, currently available for migraine headaches, there is no cure. Treatment is generally aimed first at preventing a migraine and then reducing the duration and intensity should one occur. Therefore, treatment is really focused on migraine symptoms, the key one being pain. The often severe and long-lasting migraine pain can make these types of headaches unmanageable, which means that new research into migraine treatments is vital to keep your migraine pain under control. Other areas that migraine drugs address are symptoms such as nausea and vomiting, which for many migraine sufferers can be just as debilitating as the pain. Although previously approved for use as an anti-epileptic drug, topiramate has now been approved in many countries for use as a migraine preventative agent. It was used 'off-label' for migraines, which is a term that denotes use of a drug for a different condition than the one intended. Clinical trials have shown that topiramate is generally well tolerated by patients and can reduce migraine frequency by up to fifty percent. 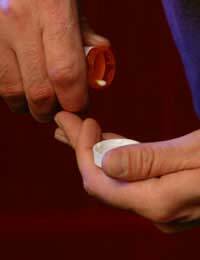 Usually, a dose of 25 mg is suggested to begin and then increased in 25 mg increments each week as required. Side effects noticed at the 100 mg target dose, usually divided over two doses, are nausea, fatigue, diarrhoea, and upper respiratory tract infections. This is a newer drug in the anti-epileptics class that is touted as a preventative medication for migraines. Some patients reported a reduction of fifty percent for migraine frequency and others still found that headaches were reduced by a quarter. Common side effects are fatigue and anxiety but the drug appears to be well tolerated in most study patients. Botulinum toxin, also known more commonly as 'botox,' is a preventative migraine and headache treatment that has not yet been approved specifically for headache treatment although a doctor can still administer botox. In a sense, it was discovered as a potential migraine treatment by accident, as patients receiving it for cosmetic purposes found that headaches and migraines were reduced. It has shown promising results in studies and in one research trial, migraine attacks were reduced by as much as a third. The procedure for an occipital nerve block injection entails several injections into the greater occipital nerve. This is a spinal nerve that is found at the rear of your head. The anaesthetic agents lidocaine and bupivacaine are injected and patients have reported immediate pain relief from migraines with the majority experiencing no side effects. Those side effects that were present included pain at the site of injection and dizziness. This is, however, not a preventative migraine treatment but it does show promise in treating migraines as they occur. This is an anti-epileptic drug that has been shown to help in migraine prevention. It is also thought to be particularly helpful in treatment of transformed migraine, a chronic and difficult to treat form and pattern of migraine headaches. Although no severe side effects are usually reported, others such as anxiety are common and may be uncomfortable enough to warrant discontinuation of the drug. The lowest dose that is usually considered effective is approximately 1500 mg although many patients will require closer to 2000 mg. This is actually a plant extract that has been used in other European countries for decades but is more recently suggested for migraine treatment. Its effects are anti-spasmodic and it is also an analgesic. Although the exact action mechanics are not fully understood, it is believed to influence the inflammatory cascade and therefore reduces inflammation associated with migraine pain. Frequency of migraine attacks has been reportedly decreased by as much as fifty percent in research studies but further studies and investigations should yield more information. The butterbur plant itself is a known carcinogen but the extract is thought to be safe for use in migraine prevention. Again, more studies should yield additional information about the potential use of this plant. Because it is believed that migraines are related to impaired oxygen metabolism, the supplement CoQ10 is thought to help in migraine treatment. CoQ10 is a substance that occurs naturally and studies have shown that it can reduce migraine frequency by up to half. A particularly beneficial aspect is that side effects are generally not experienced with CoQ10 but the ideal amount required to provide benefit is still under investigation. Talk to your doctor about available treatments but do keep aware of the newest developments for migraine pain and associated symptoms. Researchers are working hard to find ways to make your migraines more manageable and your doctor can alert you to any new treatments that may be appropriate for your headaches.